I was really nervous before my first class. 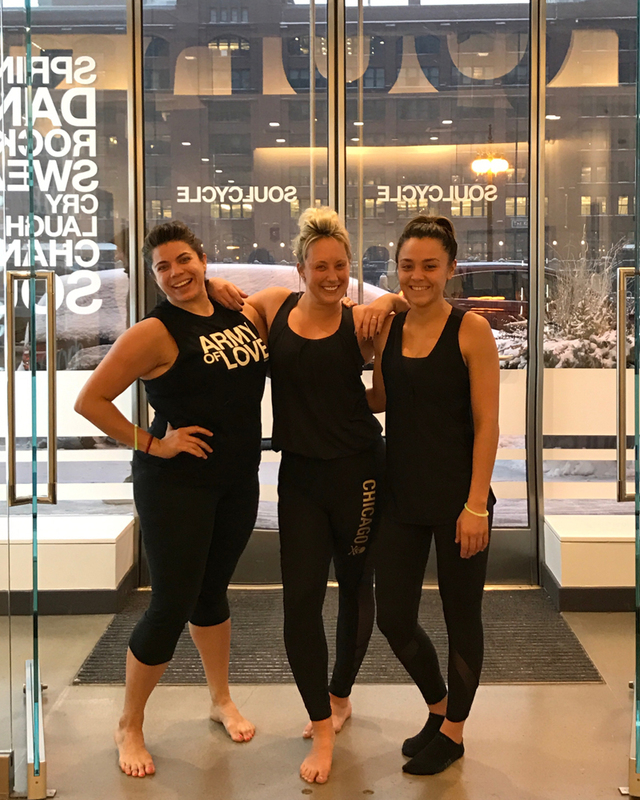 I’m usually consistent with workouts, but I’d heard nothing was as hard as SoulCycle. Plus I wasn’t feeling particularly well, which wasn’t helping the nerves. Before class started, I looked at my friend next to me, gave her a huge smile, and said something enthusiastically to the effect of, “Alright, birthday girl, you ready to ride? !” Inside, though, I was terrified of actually making it through class myself. I had no idea that my life was about to change. Lights turned off; Calvin Harris started blasting. I remember my legs moving almost on their own, finding the beat, and feeling my body come alive. I heard the lyrics, but it was the music pulsating through my veins that I was actually listening to. I remember halfway through class I was dripping sweat; the room was steaming hot, yet I had goosebumps. It was electrifying. I didn’t know exactly what was happening, but I knew I didn’t want it to end. At first, it was this high after class that kept me coming back, but then it turned into the community, specifically at The Loop. A crew that hugs and high fives each other before most people are awake, shoulder squeezes each other during class when we know someone is having a hard time, strategizes on theme rides, claps for new riders because we are pumped someone else is joining our crew, #dirtydoubles with Naz Sanders (there was once even a #tenacioustriple), and collectively “woo-hoo’s” every time Brent Locey drops a sick beat or says something inspirational. This has not only made us friends, but a family. People asked me how a 45-minute indoor cycling class could be that powerful. I truly believed, deep down in my core, that it was so much more than that. And due to a very difficult life change, I was proven right. Flashing back to my first ride, the reason I wasn’t feeling well was due to a life-altering disease starting to rear its ugly head. In June 2015, I started experiencing intense symptoms that I originally attributed to dehydration and exhaustion. (I was traveling a lot, work was busy, and it was summer, so social plans were at an all-time high). I had severe stomach pain and digestive issues, debilitating fatigue, joint pain, inflammation of the eyes, bumps all over my body that looked like chicken pox, nausea, and an overall lack of appetite. In the weeks following, I waited for it to go away, bought out Mariano’s stock of Gatorade trying to hydrate, and went to walk-in clinics. (They all told me I had pink eye and just needed fluids and rest.) It continued getting worse, and I ended up in the ER. A few days, and a dozen tests later, doctors finally had answers. Figure out a plan?! I was just trying to process what he said. How could I have this? I’m not sick. I’m full of life, an athlete, always on the go, a social butterfly, a hard worker, an optimist. Now you’re telling me my whole life is turning upside down and I will have a daily, even hourly, uncontrollable and debilitating disease for the rest of my life? My doctor started me on a round of oral medicine to try and regulate symptoms, while I stewed in denial. I went to work every day, put on my normal go-getter face, but I would have to go lie on the floor in conference rooms because I was in so much pain (not to mention having little to no control over my digestive system). Yet nobody knew, and I was terrified to say anything because that would make it real. For the first month, while I waited for the medicine to kick in, I spent every night after work curled up on my bathroom floor with the worst physical pain I have ever felt. It felt like being repeatedly stabbed in the stomach, while also feeling like my intestines were being twisted and wrung out like a rag. Having most of the pain be internal was helpful at appearing normal, but it also made me feel extremely alone. My husband, friends and family were more than supportive, but I was frustrated I couldn’t point to the pain, like a broken arm, and show people what hurt. I looked fine, so how could all of that be happening inside my body? I tried going about my normal life, but soon realized “normal” was a word I would have to delete from my vocabulary. In August 2015, I went to a wedding in New York (against doctors orders, but denial was still running high), got vehemently sick at the reception while we were in the middle of breaking it down on the dance floor (which very few things can pull me off of, so I was irate). I went back to the hotel, curled up in a tight ball, wrapped my arms around my stomach, hoping if I squeezed hard enough the pain would go away, and just sobbed. One of my friends sat with me, and told me it was going to be okay, but I had a dreadful feeling it was about to get significantly worse. On Monday I was still feeling awful, but went to work and then to SOUL. I remember feeling terrible before class, but then for 45 minutes I just rode and tried to convince myself this would pass and I was fine. Unfortunately, my body had other plans. I woke up the next morning and all of my symptoms had been Hulk-ified. I have no idea how I made it through SOUL the night before, except for the pure adrenaline from being in that room. My eyes were swollen shut, my joints had inflamed to twice their normal size, I had a 102-degree fever, inflammation bumps covered my entire body, and I had waves of nausea and absolutely zero strength to move. The Crohn’s was in full force and had completely taken over my body. My husband had already left for work and was captive on a train, so I called my parents. Through choked up sobs, I managed to tell them something was seriously wrong, and that I needed to go to the hospital. For the first time I felt an overwhelming, all-consuming sense of fear. How could I handle this? I’ll never forget my mom helping me get dressed and then my dad carrying me to the car because I couldn’t walk. The last time he did that was off a basketball court in 8th grade when I had a sprained ankle. A much more helpless feeling at 30 years old than 13, but still the same comfort I needed from them in the moment. I ended up being admitted and stayed in the hospital for a week. I had visitors, but was alone for a large part of it and it was the scariest, darkest, and emotionally draining time of my life. I realized I would always have support, but I was going to have to fight this battle internally if I wanted to make progress. I gave in to Crohn’s that week. This wasn’t going away. It was a real, permanent part of me now, and I needed to take action. While Crohn’s was in control of me physically, I was in control of my reaction to it. I knew I had to make some changes and started with reducing stress, pulling back at work, learning as much as I could about my disease (knowledge is power), finding a support group and figuring out what my new physical limits were. The next year and half included a handful more hospital appearances (let’s just say the nurses and I became tight), starting an immune suppressant chemotherapy drug every seven weeks, filling a total of 26 different prescriptions to find the right daily medicine cocktail, always wondering if I was going to have to back out of social plans, if I was out in public and wasn’t near a bathroom what would happen, having to ask doctors if I could still have kids, cutting 12 inches of my hair off because it was falling out, accepting that my body was happier with a bowl of pasta (instead of a salad) because it was easier to digest, succumbing to limits, but then also figuring out how to push past them. From August 2015 – May 2016, I continued to ride when I felt up to it. But it was in June 2016 (my one year anniversary of Crohn’s symptoms), when I turned it up. I was feeling better, but still not in remission. There is no cure for Crohn’s, and it never goes away, but remission is possible and that means symptoms are reduced on a day-to-day level. I was determined to hit this milestone. My doctor previously said working out might cause complications with my condition as physical exertion can aggravate symptoms since it is a stress (while a good one) on the body. 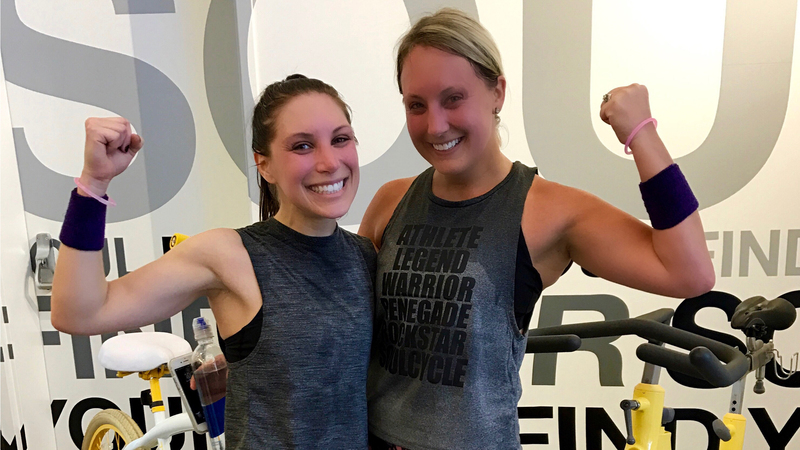 In the gym or playing sports was when I have always felt the best in the past, though, so I challenged myself to a 14-day straight workout boot camp which included daily, double workouts (mostly riding). 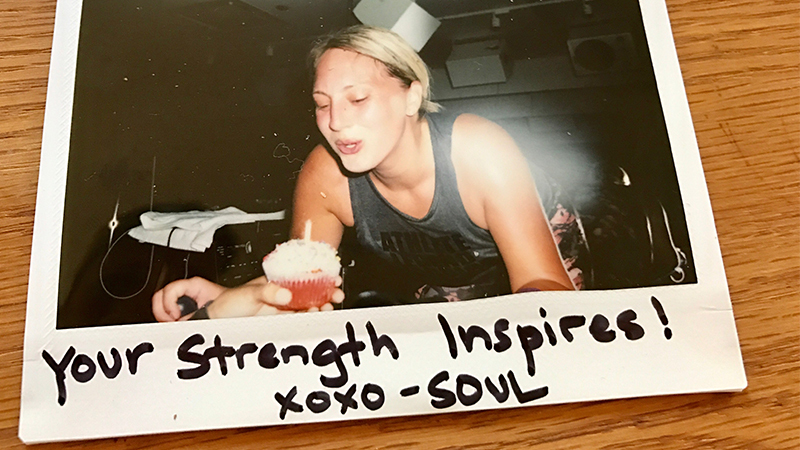 Nobody in that SOUL room knew this part of my life; I was just the girl who rode on bike 5, and so I used every moment in that dark, private space to really work through my emotions. During every tap back, fast run, steep hill, and SOUL song I said hello to my friends denial, anger, sadness, pain and fear, but then also hung out with happiness, strength, courage, pride, acceptance and love. I let myself feel each one, smiling during the highs, and letting the tears stream down during the lows. (Thankfully they kind of looked like sweat in the dark so nobody could tell). Getting over the initial hump was the hardest, but every time I doubted myself, I just cranked that wheel to the right. “I can’t do this.” Crank. “Ugh, stomach pain, fell off beat.” Crank. “Pick it up the next 8 count, you’ve got this.” Crank. “Are you going to let Crohn’s win, Carly?” Crank. “I didn’t think so, work harder.” Crank. “Push past the pain, past the limit.” Crank. “Yes, there is a rule, but be the exception.” Crank. “You have Crohn’s, but you are still Carly.” Crank. My wheel would get so heavy, my legs couldn’t move, but it was in this stillness that I started to feel hope. If I could get up this hill, I could handle Crohn’s. Two weeks and 28 workouts later, I was physically exhausted, but finally at peace. My mental stress was at an all-time low (I’m pretty sure I sweated it all out) and I saw if I treated my body well, and showed it I wasn’t giving up, it responded positively. I went into official remission shortly after, and truly experienced mind over matter, which is something Brent and Naz say all the time in class — they just didn’t know how much it hit home with me. I also think the TBT throwback jams (my favorite) were a contributor to remission! At this point, I wanted to start sharing this with people in my life, but didn’t know how. The disease has a stigma attached to it and I still felt uncomfortable admitting and talking about it. Then a moment presented itself that helped this transition. I had one of my chemotherapy treatments and still felt sick the morning after when my alarm went off for Wednesday morning SOUL. Extremely hard for me to accept, but I knew my body couldn’t do it, so I had to skip class. My sister was riding that day, and we were on our normal bikes right next to each other. Brent walked up to her and asked if I had hit a “workout wall” (I was simultaneously pushing hard to get in better shape for a vacation) and if that was the reason I wasn’t there. My sister, being the honest, amazing women she is, didn’t know what to say and just started talking about how I was still sick from my chemo treatment, was bed-bound, throwing up and couldn’t make it. She texted me after and apologized, but I’m glad she let the cat out of the bag to someone, especially in my SOUL world, other than the few people in my life who knew. I ended up sharing my situation with Brent and he told me he never would have known with how hard I pushed myself. That moment solidified I was still the strong me I knew, both inside and out, and that I could rock Crohn’s like I’ve never rocked anything before (ok maybe other than dancing to Ludacris on a dance floor). The remaining fear washed away and I decided to celebrate my official remission, or my “Crohn’s coming out party,” at the end of 2016 in my safe haven with my SOUL family. Ironically it was a Survivor class. The room rocked purple swag (Crohn’s color), Brent played an awesome playlist and extended podium honors to close out class. During the last song, I looked out at the amazing group in the room. I was exposed; they all knew now. Instead of being scared or nervous what people thought, I felt freedom and love as I saw the smiles being sent back my way. This ride was the most special milestone on this journey and post class was the first time I shared “I had Crohn’s” publicly to everybody I knew. I was no longer embarrassed; I was proud of the hill I had climbed and how I made it down the other side. I knew I would have to climb the hill multiple times throughout my life with this disease, but for now I was on straight road. I no longer take any moment for granted. Life could be short, and I want to live every day to the fullest. I take on more challenges and risks on and off the bike and try to live every day without fear of the future, but with joy in the present. I ride as often as I can with Brent, Naz, Aya and our Loop crew and thank God for every moment I am blessed to clip in. On days when I’m not feeling 100% because the Crohn’s decides it wants to throw a party in my body, I still tell myself it doesn’t run my life, I do. I clip in and repeat that in my head during hard runs on the bike. “You run your life, so run right now. Pain is temporary, 20 more seconds, 10 more seconds, you have this, you are strong, you are a fighter, you can do it.” And I do. SOUL, thank you from the bottom of my heart: You brought me back to life. 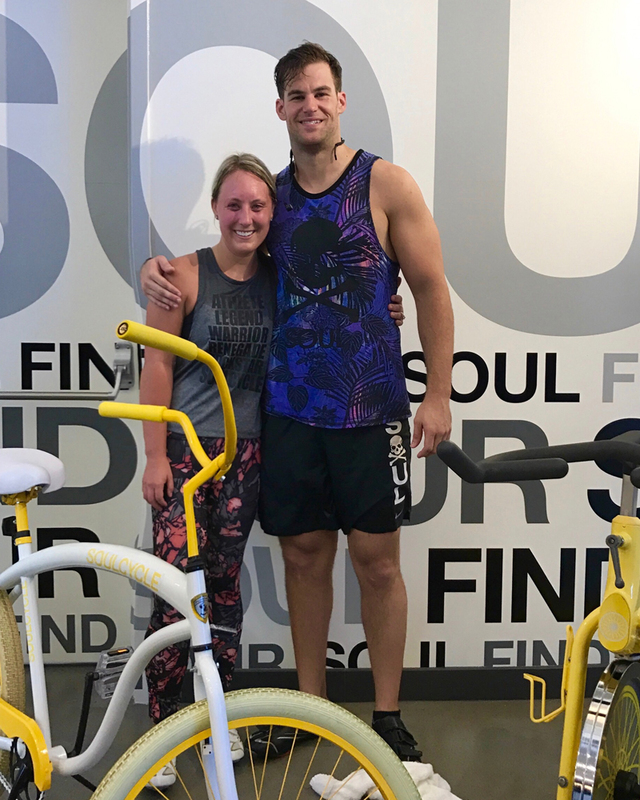 Definitely living, breathing proof Soul is MUCH more than an indoor cycling class. Cheers to life, Chicago, and see you on the bike.